Student book and eText – the popular choice for Psychology. See also the new Psychology Essentials textbook and eText designed to be used alongside the core textbook as a condensed guide to Psychology with targeted language for EAL students. Read more about Essentials here. Four new and revised titles providing comprehensive coverage of the most popular history topics for the 2015 Group 3 curriculum. Each title provides coverage of the appropriate topics, equipping students with the knowledge and skills needed to answer essay questions on Paper One and Two. Each textbook is supported by an eText, giving four years access to online materials such as worksheets, quizzes and enlarged source material to develop examination skills and extend studying. A clear overview and analysis of key events. Practice in analysing source material, including photographs, cartoons, letters, speeches and other documents. Support throughout for new curriculum features, including key concepts, ATL and international mindedness. Approaches to learning highlighted in each activity throughout the book. Focus on the examination requirements, with 'hints for success' throughout, as well as quizzes on the eText. Our two latest titles offer specific support for Paper 3 of the 2015 History curriculum. Each textbook provides comprehensive coverage of the appropriate topics, equipping students with the knowledge and skills needed to successfully answer essay questions on Paper Three. Written and developed by experienced IB teachers, who also have experience in examining and leading workshops, these new books will help students prepare thoroughly and methodically for their exams. Each of our history textbooks is supported by an enhanced eText, giving four years access to online materials such as worksheets, quizzes and enlarged source material to develop examination skills and extend studying. For your local prices please contact your Pearson representative. Student textbook and eText written specifically for the 2011 curriculum. Clearly differentiated content for both Standard and Higher Level students. Includes highly visual graphs and topical examples to aid students’ understanding of real-world economics. Contains answers to quantitative exercises found throughout the book. See also the new Economics Essentials textbook and eText designed to be used alongside the core textbook as a condensed guide to Economics with targeted language for EAL students. Read more about Essentials here. This comprehensive 2nd Edition textbook and eText covers all eight topics from the 2015 ESS course, along with advice on Internal Assessment, the Extended Essay, and links to Theory of Knowledge. It will help students to prepare thoroughly and methodically for their examinations. Written by experienced IB teachers and examiners, Andrew Davis and Garrett Nagle. Detailed diagrams and photographs help to explain key concepts. Practice questions from past examination papers help you with exam preparation. ATL skills are addressed in Challenge Yourself boxes and the online worksheets. Significant ideas, big questions, and key concepts are signposted throughout. Provides guidance on Internal Assessment and the Extended Essay. Written to give an international and transdisciplinary perspective. See also the ESS Essentials textbook and eText designed to be used alongside the core textbook as a condensed guide to ESS with targeted language for EAL students. Read more about Essentials here. 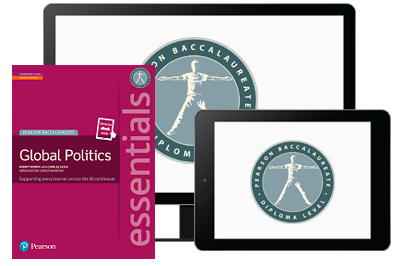 "It takes all of the essentials from the IB subject guide and presents them in a way that is useful and concise. The specific examples of each of the concepts is helpful for teacher planning. The ebook features look great and really play to the students' love of technology and ease of taking notes and finding definitions. The margins that feature vocabulary and synonyms are helpful for students studying for TOEFL and IELTS as they are always keen to increase their vocabulary. The charts, graphs, and graphics are also helpful for EAL students as well as students studying for those language tests (as interpreting graphs is often part of those tests). I would definitely use the book and would recommend it to other GloPo teachers. I think that this is what we as teachers have been waiting for and GloPo would be offered in more schools once this book is available and teachers become aware of it." 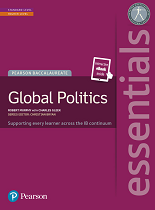 This new course textbook and eText for Global Politics from our Essentials series, contains comprehensive concept-based coverage of the new Global Politics subject guide. Focusing on the overarching concepts, such as Power, Sovereignty and Peace, this new textbook and eText also supports students with key terminology and language, plus theoretical underpinnings and help with exam skills (essay writing and presentations in particular). The Essentials format – and focus on vocabulary - makes it perfect for EAL learners too. Plus, its clear structure is great for revision. truly blended learning approach with printed textbook and eText with flexible interactive digital resources.